San Vito Chianti DOCG (750cl) This is an organic Chianti produced from 100% Sangiovese grapes by the Tenuta San Vito Estate, in the beautiful rolling hills that surround Florence. This prestigious and popular Tuscan wine is a dark ruby red with an appealing fresh fruity bouquet. Full-bodied, round and harmonious in the mouth, matured in the bottle to harmonise and develop. 90/100 James Suckling (Outstanding: a wine of superior character and style). Year: 2015 Alcohol: 13%. Toscana Madiere IGT (750cl) This organic, deep ruby red Super Tuscan is characterised by rich, lingering aromas suggesting wild red berries and spice. It is harmonious and balanced on the palate. Matured for at least 12 months in French Allier oak barriques, followed by further bottle-ageing, this is a very distinctive wine suited for lengthy cellaring. Commended in the Decanter World Wine Awards 2015. Silver Award Winner Concours Mondial de Bruxelles 2016. Year: 2015 Alcohol: 13%. Chardonnay Amantiglio Toscana IGT (750cl) Our organic Chardonnay is brilliant straw blond in colour with an elegant appearance. It is a harmonious, balanced wine on the palate with crisp, tasty acidity and rich flavours and a fragrance of fresh apple, grapefruit and mandarin. Perfect with a starter such as goat's cheese with ripe figs. Ideal with risotto, seafood dishes, and with poultry and veal. Wonderful too as an aperitivo before your meal. Year 2015 Alcohol: 13.5%. 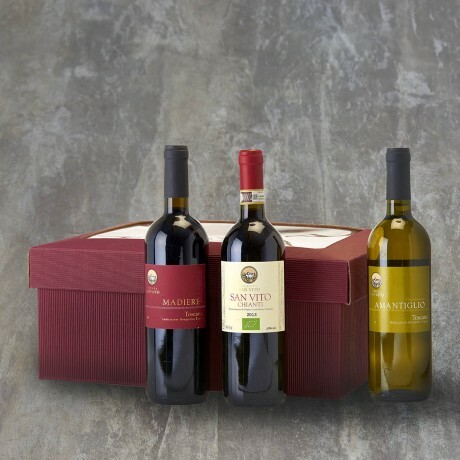 The wines are carefully packed in a strong hamper box which is tied with a lovely ribbon. A gift message option is available at the checkout for you to send a personalised message to your recipient. Please note that if we are out of stock of any item we reserve the right to substitute it with the most similar available item.